“If there were a Cuban food & Thai food soft focus, falling-in-love montage, Malaysian food would be that montage. In my mouf.” said @ckwinny on Twitter yesterday. The idea of Cuban cuisine meets Thai cuisine seems a bit weird to me, but living in Asia perhaps she has a better idea of it than I do. Nonetheless, Malaysian cuisine has influences from Thai, Indian, Indonesian and Chinese cuisines, so food is often spicy. They eat a lot of rice, noodles, seafood, meat, coconut, vegetables and fruit. Tofu and lentils seem to be pretty common too. This recipe for tempeh rendang originates from the International Vegetarian Union website. It sounds quite spicy from the recipe, but I found it too mild for my tastes, even a bit bland. I wonder if my spices are too old or what’s the problem, but you can probably use more spices than the recipe specifies. The toasted coconut is wonderful – I never tried it before, not being a big fan of coconut, but I’m going to use it a lot more. You can use more of it as well, or toast more of it and use the rest for something else, sweet or savoury. 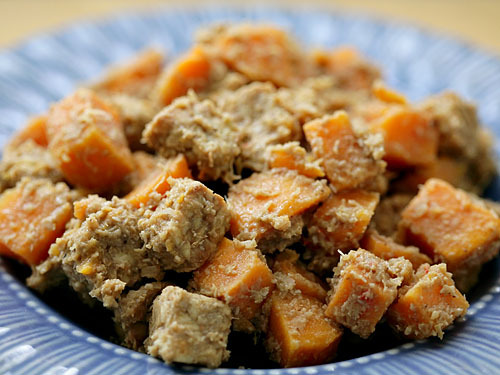 The original recipe had one sweet potato, but the recipe author must be using very small sweet potatoes, as I used about 2/3 of what I thought of as a medium one, and I think there was too much sweet potato compared to tempeh. So I’d use half of one. I also did not use the scallions, as they’re very expensive this time of the year. The original recipe also had “2 chilie bell peppers”. I’m not sure what this meant – chili or bell pepper – but I figured it was chili (later on it said “You want to use small long skinny cilie peppers”) and I used two fairly mild red chilis. Instead of ground star anise or fennel seed I used ground aniseed and I used ready-made lemongrass paste (though probably shouldn’t have). Cube the tempeh and sweet potato into about 1/2 inch/1 cm cubes. Blend the fleshy part of the lemongrass stalk together with the shallot, garlic and chili into a paste, you may have to add a little water. Toast the coconut on a frying pan over medium heat (without oil) for a few minutes, stirring or shaking regularly so that it doesn’t burn. It should be fragrant and light to medium brown. Transfer to a plate. Heat the oil over a medium high heat and fry the tempeh until browned. Add the spices (both the dry ones and the spice paste you made) and fry for two more minutes. Add the sweet potato, coconut milk and water. Cook until the sweet potato is tender, occasionally stirring. Remove from heat, add toasted coconut and salt and pepper. Garnish with the scallion and serve over rice or another grain. This entry was written on April 30th, 2010 by Maija Haavisto and filed under Asia, Other main dishes.